Cigna Corp., which reported higher 2017 fourth-quarter and full-year revenue on Thursday, isn't worried about the potential threat posed by the Amazon-JPMorgan Chase-Warren Buffett mashup unveiled earlier this week, even though the announcement sent insurance stocks spiraling down. Instead, Bloomfield, Conn.-based Cigna sees the new employer coalition, built to tackle rising healthcare costs, as another opportunity to leverage its expertise in value-based funding arrangements, medical management and ability to keep cost trends low, according to CEO David Cordani. "It reinforces something we've been talking about for quite some time, which is it's a pretty dynamic industry, and the older orientation around focusing only on insurance or a fee-for-service healthcare delivery model is just fundamentally not sustainable, as employers and customer demand more," Cordani said Thursday during a conference call with investors. Cutting insurance companies out of the equation won't solve rising healthcare costs, he said, because the payers' margins are already low. Cigna's low medical cost growth of less than 3% for the year led to strong financial results across its segments, the company said. Customer growth and higher premiums and fees helped boost the insurer's revenue in the three months ended Dec. 31 by 5.9% to $10.5 billion year over year. Its revenue totaled $41.6 billion for the full year 2017, up 4.9% over 2016. 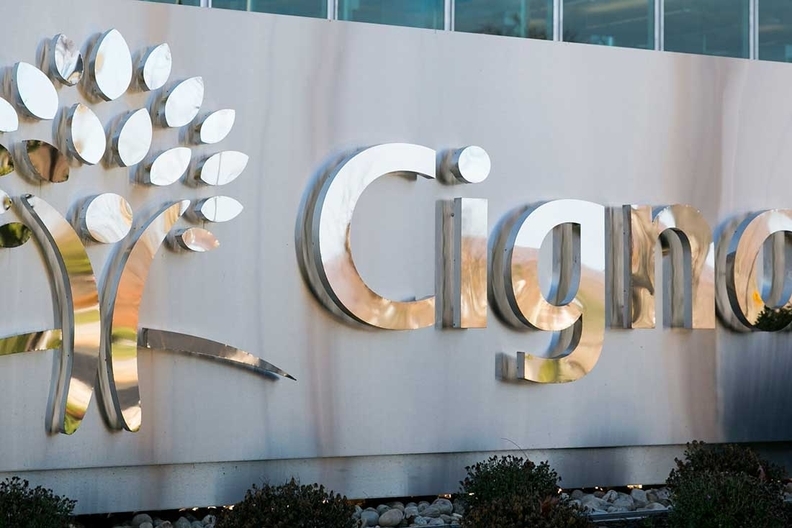 Revenue from premiums and fees for administrative services-only arrangements in Cigna's global healthcare segment grew 7.2% to $6.2 billion and 5.1% to $1.2 billion, respectively, in the fourth quarter, driven by customer growth in Cigna's commercial insurance plans. Full-year premiums totaled $24.5 billion, up 5.3% over 2016. Over the same period, revenue from fees grew 3.1% to $4.5 billion. Cigna grew membership by 4.7% to 15.9 million at year's end, compared with 2016. It added almost 800,000 members in its commercial insurance segment during the year, but lost about 80,000 members in its government-funded insurance plans, which includes Medicare Advantage and Medicaid. Cigna had been dealing with federal sanctions, handed down in January 2016, after the CMS found major problems with its Medicare Advantage plans, barring it from enrolling customers. But those sanctions were lifted in June, clearing the way for Cigna to enroll new Advantage members during the Medicare open-enrollment period. Like rival insurer Anthem, Cigna Chief Financial Officer Eric Palmer said the company's individual insurance plans "generated a small profit in 2017," despite complaints by many insurers last year that the individual market was unsustainable. Cigna, which sold plans through the Affordable Care Act public exchanges in seven states in 2017, ended the year with 297,000 individual members. Of that, 214,000 members, or 72%, were enrolled through the exchanges. Cigna is selling plans through the exchanges in six states this year. The insurer's leadership also said that Cigna will benefit from recent U.S. tax reform that reduced the corporate tax rate from 35% to 21%. Cigna said it will benefit to the tune of $575 million in 2018 and will spend $150 million of that on investments in innovation and its employees. Cigna on Wednesday said it's using the proceeds from tax reform to set a minimum wage across its U.S. employee base of $16 an hour, as well as boost the salaries of certain employees to above $16 an hour. The wage increases will total more than $15 million, the company said. Its medical loss ratio, which represents the percentage of premium revenue spent on medical care and quality improvement activities, was 84.1% in the fourth quarter, up from 83.1% in the fourth-quarter 2016. Its full-year MLR was 81.4%, down slightly from 81.6% in 2016. Cigna's fourth-quarter net income totaled $267 million, down 28.6% over the same quarter in 2016. However, the insurer grew full-year 2017 revenue by 21.1% year over year to $2.2 billion.